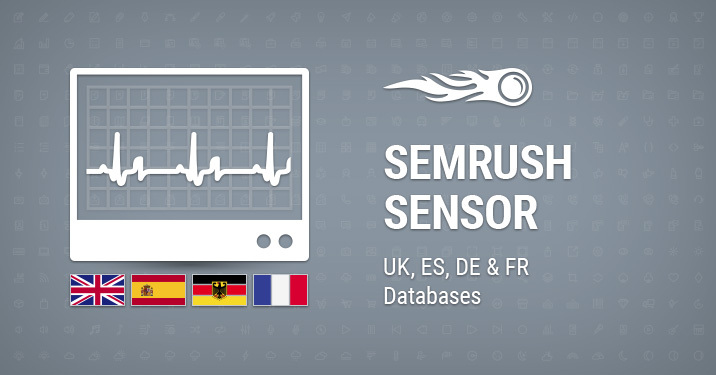 We are happy to extend the reach of SEMrush Sensor — a service that tracks the volatility of Google search results on a daily basis. By popular demand, we’ve added the databases you’ve asked us for the most — now Sensor monitors UK, ES, DE & FR desktop SERPs! Are there any changes in Google’s ranking algorithm? Is my site the only one that has changed positions in Google SERP? What industries are suffering from ranking volatility today? [email protected]. Thank you for making us better!